The meeting had 8 members and 2 guests present, with Board of Directors attending as follows: Curtis Newsome, Jeff Turner, Anne Parker and Nancy Turner. Franklin, VA. The Robo-Regatta is a cardboard boat race using boats constructed of only cardboard, tape, glue, paint and caulking. Go to the following web-site for more info. The area around Surry County, Virginia, is already home to some sinister projects, including several major coal ash disposal sites and Michael Vick’s infamous dog fighting operation. One of the disposal sites is the local golf course, the Battlefield Golf Club. The green is sculpted with 1.5 million tons of coal fly-ash. 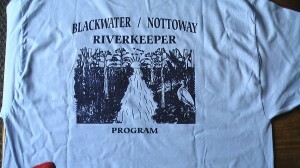 We have new t-shirts with the original water scene on the back. 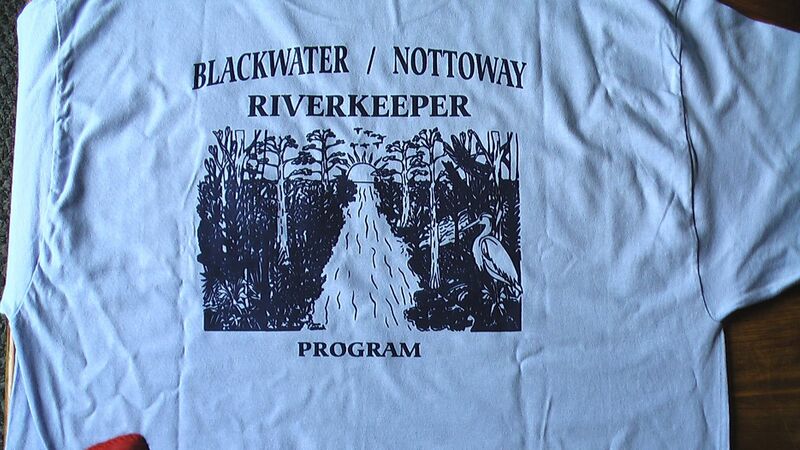 These shirts are a copy of the limited edition shirts we had made when the BNRP was just getting started in 2000. Danny Cheek and I designed these shirts back when he was still alive. They have always been my favorite. They are light blue, heavy grade shirts with our logo on the front pocket. Sorry about this but it will take a $15 donation to get one because the cost was nearly $12 for these nice shirts. You can send donation (specify size, no small) plus $5 shipping to BNRP, PO Box 44 Sedley Va. 23878. Or click on the Donation link on the homepage to send payment that way. Be sure to specify size (M, L, XL, XXL) usually one size bigger than you think works best.